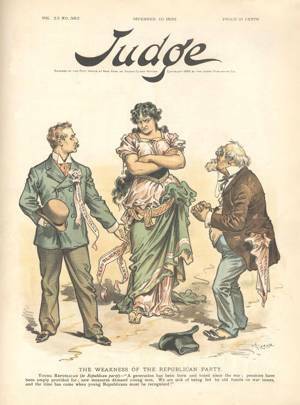 In a post-election analysis, this Judge cartoon blames the Republican loss of the White House in 1892 on old issues and old candidates (Benjamin Harrison was 59). The Young Republican argues to an angry Republican Party, “We are sick of being led by old fossils on war issues, and the time has come when young Republicans must be recognized.” Earlier that summer, several delegates had wanted to replace President Harrison at the top of the ticket with the younger governor of Ohio, William McKinley. But the popular 49-year-old Midwesterner would have to wait another four years.